Chances are if you are a triathlete, thinking about trying triathlon or have followed sports news in the slightest, you have heard of Chrissie Wellington. Just in case… Chrissie Wellington (OBE, by the way), is a four-time Ironman World Champion, first British World Champion triathlete, and smiliest racer on the course and she’s written a new book, To The Finish Line. 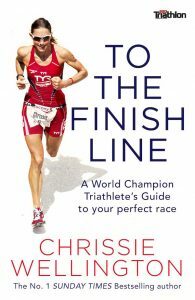 For her second book (the first was A Life Without Limits, an autobiography), Chrissie draws on her own experiences to help YOU navigate, and excel at, your first (or 100th) triathlon. To The Finish Line covers a plethora of topics, ranging from fitting triathlon into your life to nutrition advice, all in a relaxed, readable way. To The Finish Line is an enjoyable read. Despite being nothing short of a triathlon goddess, Chrissie writes in a way that’s approachable, understandable and interesting. To The Finish Line can be read from start to finish, but it’s easily just as great as a go-to when looking for something specific. We really love how comprehensive To The Finish Line is, without being boring or too technical. There are some excellent Q & A sections, including questions about topics such as injury, training whilst away, off-road running and even an ‘I don’t feel confident in a trisuit*’ question! The questions are all answered from a place of insight and knowledge, but the answers never feel condescending. We even hear from some of Chrissie’s coaches about where her weaknesses were and what they did to fix them! Other sections, such a Chrissie’s pre-race playlist and Chapter 8 on psychology, make the book stand out even further from other triathlon ‘how-to’ books. All-in-all, this book, as might be expected, is really great. However, despite featuring anecdotes and examples of other triathletes, some die-hards may try to copy exactly things like Chrissie’s race nutrition plan. Our only advice is to remember to take an ‘individualised, athlete-centric’ approach to your training, as advised by sports-nutrition professor Asker Jeukendrup in the book! PS- we also don’t advise using cooking spray as a wetsuit lubricant. The book mentions that some triathletes use this, but we’ve seen this result in some nasty sunburn on a sunny day! Yes!! 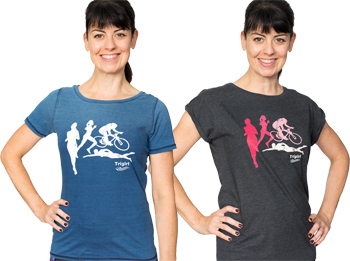 To The Finish Line, at £18.99, offers so much advice worth so much more! Though a book can’t replace a good coach, To The Finish Line is packed with tips offered up by Chrissie and some of the world’s best. In addition, if/when you are ready for a coach of your own, there is even a great section on what to look for to find the perfect coach for you! 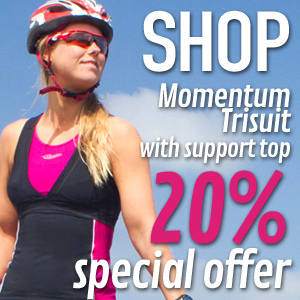 * Our advice for guaranteed trisuit confidence- wear Trigirl! For more about Chrissie, check out her website here.